On the third Monday of each month, senior citizens gather in Barwon Heads to enjoy a two-course meal with wine for $6. It’s all made possible by Lions Club of Ocean Grove Barwon Heads, which has been running the event for around 15 years. Anywhere between 40 and 80 people file into the Barwon Heads senior Citiens hall on Clifford Parade each month. It’s a social gathering as well as a cheap meal. 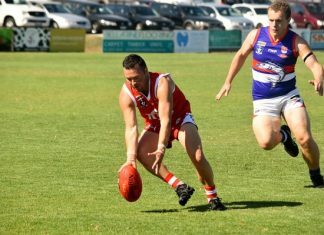 “For an older community like us, it’s a great opportunity for them to come down and get out and meet each other,” Lions life member John Brady said. Mr Brady is the chief caterer. And the food is good, too.He serves up anything from gourmet pies, to roasts, to lasange to corned beef. The desserts are delicious and many imbibe in a Monday lunchtime glass of wine or two. A hard-working team of volunteers man the kitchen from around 8am on the day and don’t leave until after 1pm. It takes around 25 hours of volunteer time to make the lunch happen. The banter in the kitchen between the Lions members is an entertaining sideshow. “The food is perfect – you couldn’t get better food anywhere,” Mr Brady says with a wry smile. 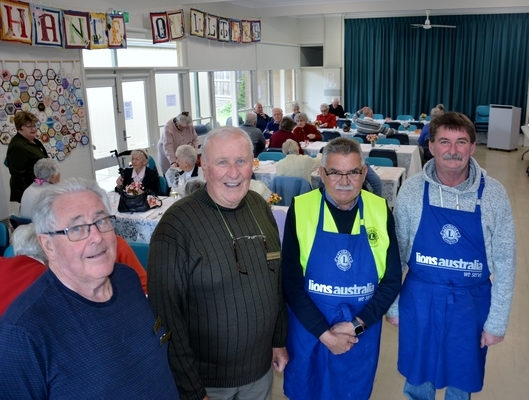 “We’ve always tried to maintain our link with the community,” Ocean Grove Barwon Heads Lions Club president Grant Hull said. “We’re the seventh-oldest club in Australia. Lions Club of Ocean Grove Barwon Heads also received the prestigious 2017/18 Bank of Ideas district award. Lions Club of Ocean Grove Barwon Heads began its work on 28 June 1955 and today is a major contributor of various community projects in the two towns.